Cool Chromes is a semi-regular feature where we take a look at some slides that have come off the scanner. 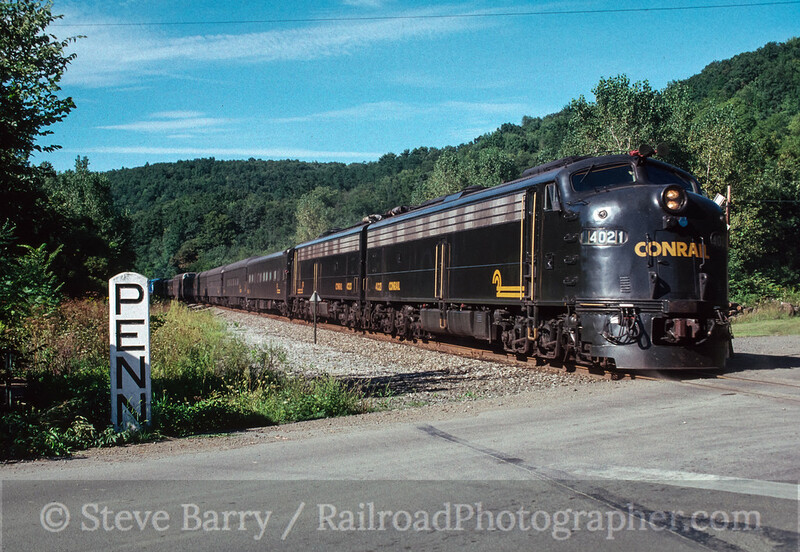 In today's edition of Cool Chromes we're going to look at the Conrail business train, which was used for Office Car Specials (OCS). 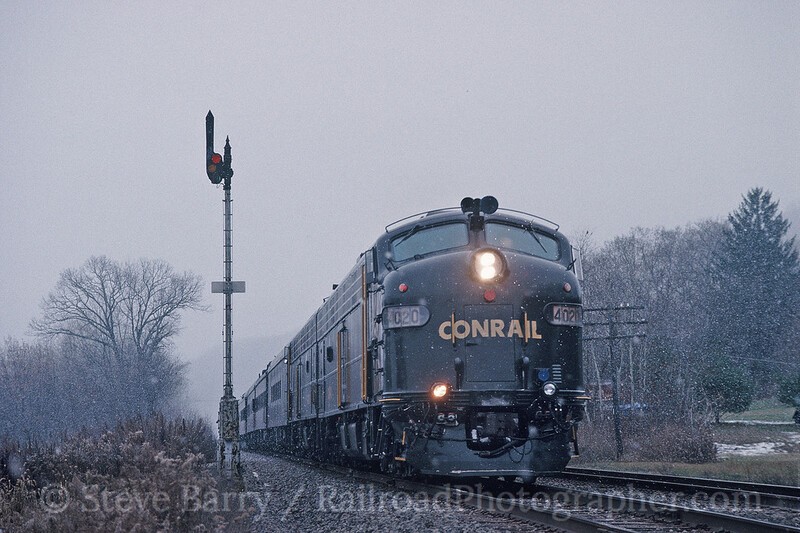 While many Class I railroads have business trains, Conrail's was especially elegant, painted in Pullman green with two streamlined E8 locomotives built by the Electr-Motive Division (EMD) of General Motors. Our first shot (above) shows the OCS on an employee picnic trip to Hammond Lake in upper Pennsylvania in 1989. 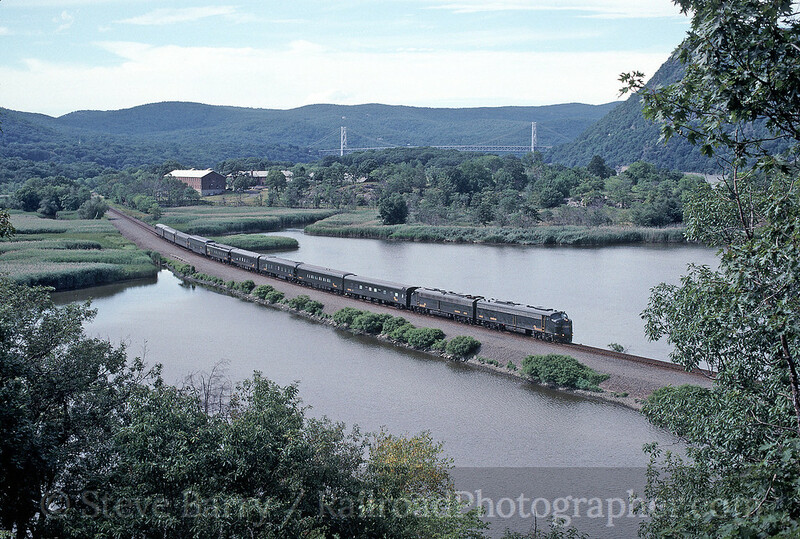 The train has come across the Southern Tier line in New York state and turned south near Corning to enter Pennsylvania. Here it is at Lawrenceville, Penn., right on the state line. Next, we're actually on the Southern Tier in November 1997. West of Binghamton, N.Y., the Southern Tier was one of the last holdouts of semaphore-style signals in the U.S. (only one major stand of semaphores still exist in the U.S., along the line over Raton Pass in New Mexico). A late fall snow flurry is coming down as the OCS passes one of the classic signals. 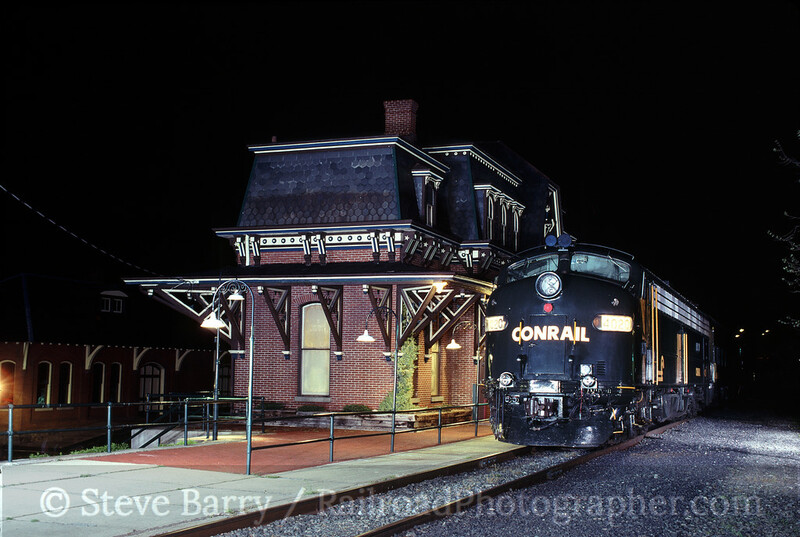 Now we're in April 1998 and one locomotive of the OCS is spending the night next to the former Central Railroad of New Jersey station in Bethlehem, Penn. This was a particularly busy day for OCS trains in this part of the woods -- Conrail had three E8s for its business trains, and this one was assigned to one train while another had the other two E8s. Both trains were in the Allentown-Bethlehem area on this day. We'll finish off with a shot from the Hudson Valley in New York state. The OCS is southbound exiting Iona Island. The BEar Mountain Bridge over the Hudson is visible in the background. The OCS trains usually ran with some advance notice, and it was not uncommon to get shots of them. After September 11, 2001, however, railroads decided that business train moves were going to be primary targets for terrorists (go figure) and clamped down on releasing advance information on the trains.